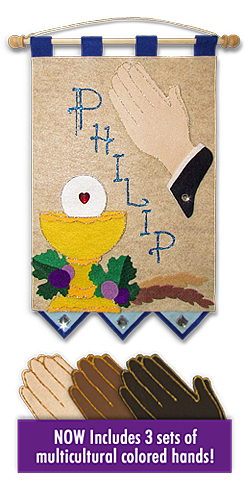 Our "Praying Hands" First Communion Banner Kit is trimmed with Royal Blue accent pieces and contains EVERYTHING you need to make one truly beautiful keepsake banner. An EXCELLENT sacramental symbolism lesson. Our First Communion Banner kits are hand-crafted in the USA by us, and are made from the highest quality components available. Afraid of working with glitter glue? Have no fear -- we now offer elegant, custom cut, self-adhesive Sticky Felt Letters for use on this kit! Still interested? Click here to learn more!